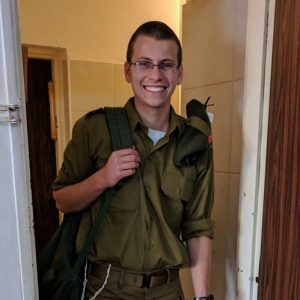 Critically-injured IDF soldier Nathaniel Felber grew up in the United States and moved to Israel from Maryland several years ago. Here’s an update written this past Wednesday by Natanel’s cousin: Last Thursday, Netanel Felber, Netanel Ilan ben Shayna Tziporah, was shot several times in the head protecting civilians at a bus stop from terrorists. Two of his fellow soldiers made the ultimate sacrifice. He is currently in a coma and in “stable” but severely critical condition. The outlook remains pretty grim. But we remain hopeful, and are asking you to PLEASE keep Natanel Ilan ben Shayna Tziporah in your prayers. This morning, when his dad Joe told him that they would be putting tefillin on his arm, Netanel moved his shoulder as if he was giving Joe his arm to help him put the tefillin on. Please keep him in your prayers and thoughts! 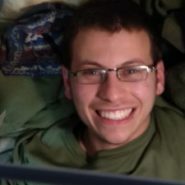 Let’s pray that soon Natanel’s smile will return, and that he will return home again–healthy and whole, please G-d! The world needs that bright smile. IyH his family will see it again soon. Please keep us updated. I read yesterday that there was a small improvement in his condition, but his life is still in danger. There was a large gathering at the kotel this week to daven for his recovery. A huge segulah that has always worked in my family was to write the name of a sick person near the asher yatzar bracha (the blessing said after using the bathroom). If you have him in mind when you say the last line “rofaih chol bassar umaflei laasos”, it helps the person have a refuah. We have seen great nissim with this. I’m going to put his name there right now, and maybe other readers will do this too. That smile is just so precious. Thank you for sharing that segulah. I had never heard of that practice, but it is brilliant. May Netanel Ilan ben Shayna Tziporah be healed completely and speedily please G-d.